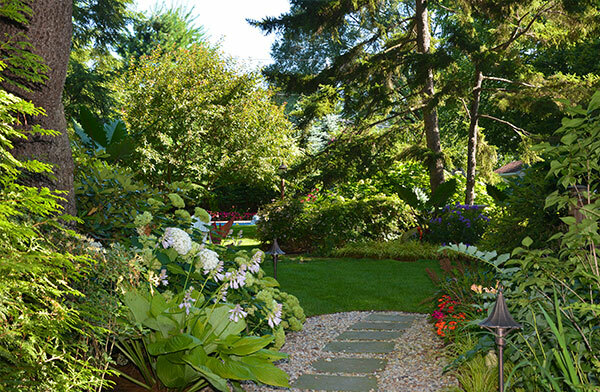 The clients envisioned their backyard as a tranquil getaway, but the landscape was in disrepair when the team arrived on site. Undefined expanses of lawn, decaying trees and thick clay soil. Gravel areas, drywells, catch basins and French drains were installed to provide infiltration on-site and keep new plants from sitting in water. 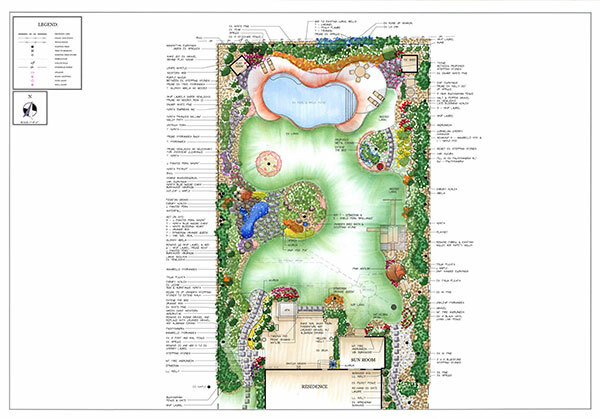 In addition to entertaining up to 100 guests and wanting their yard to be an escape from the daily grind, the clients are very involved with their landscape. 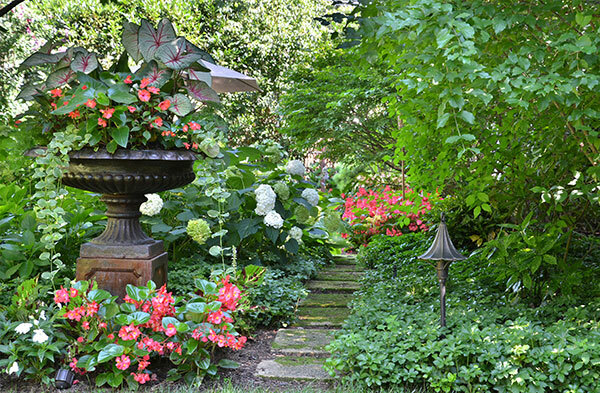 They enjoy annual color displays for spring, summer and fall, and are consistently involved with providing inspiration and suggestions for planting. The design team added large cast iron urns and cast stone planters to provide an elevated explosion of color in the landscape, increasing the impact of the changing seasonal color display. The project earned Goldberg & Rodler a 2016 Grand Award from the National Association of Landscape Professionals’ Awards of Excellence program. 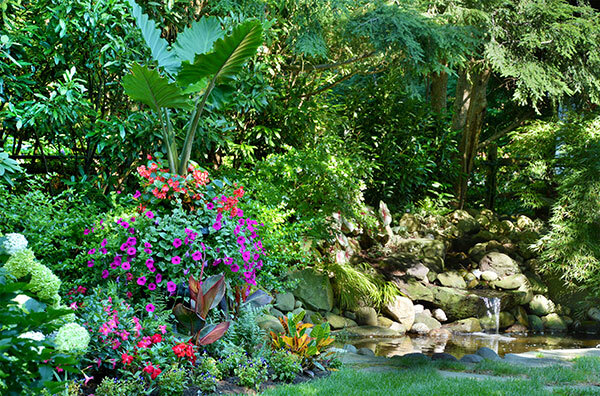 A peaceful oasis in a secluded backyard retreat is enlivened by the sound of a waterfall and colorful annuals. 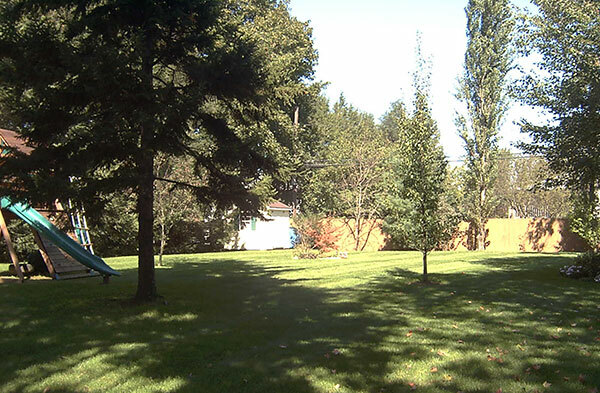 This “before” shot shows a lackluster backyard. 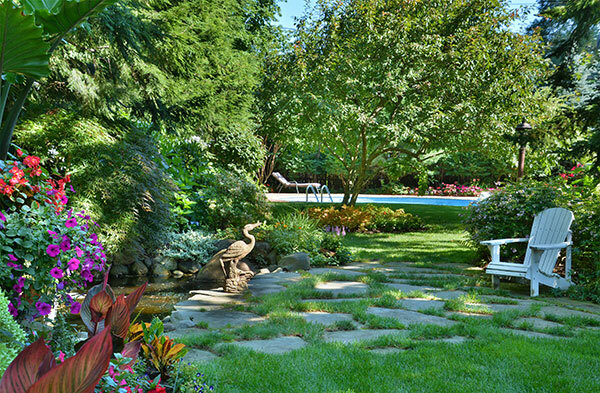 A once-expansive yard is now a series of tranquil, interconnected gathering areas. 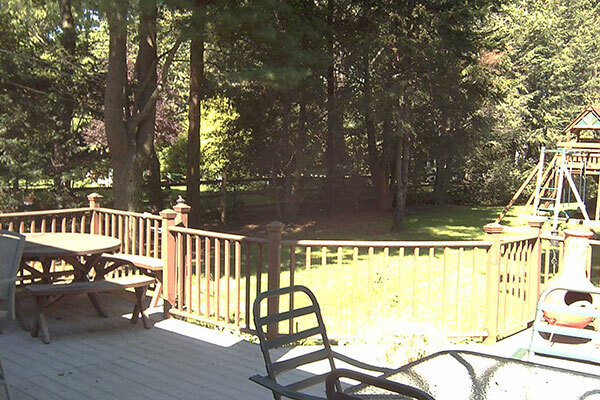 The previous deck and a lack of screening, as seen in this “before” picture. 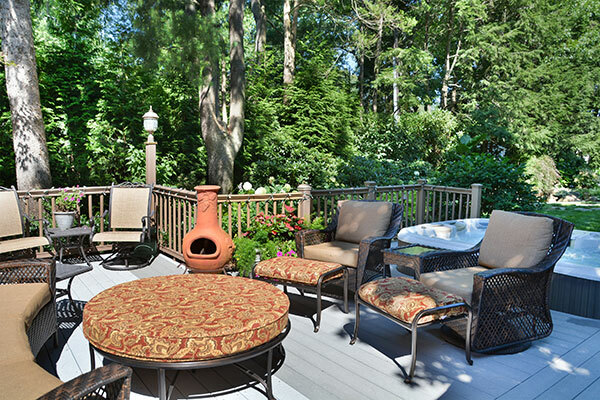 The deck was extended, and a diverse woodland planting screens neighboring properties. 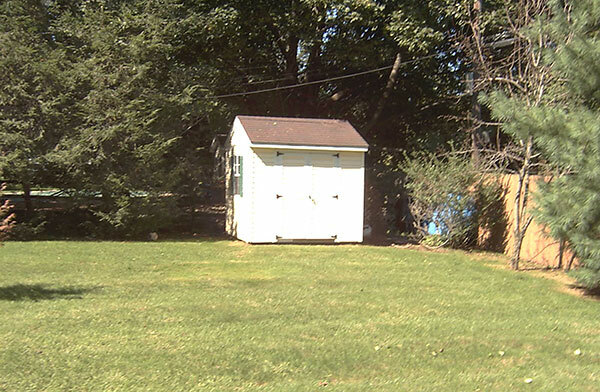 In this “before” photo, the shed dominates the landscape. A lush planting bed blocks the view of the shed. 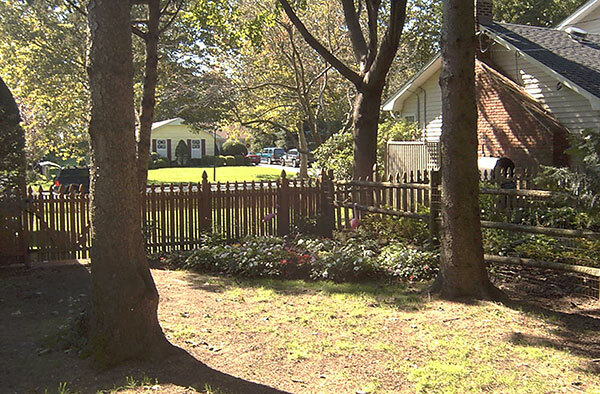 This “before” shot depicts a bland transition to the front yard. 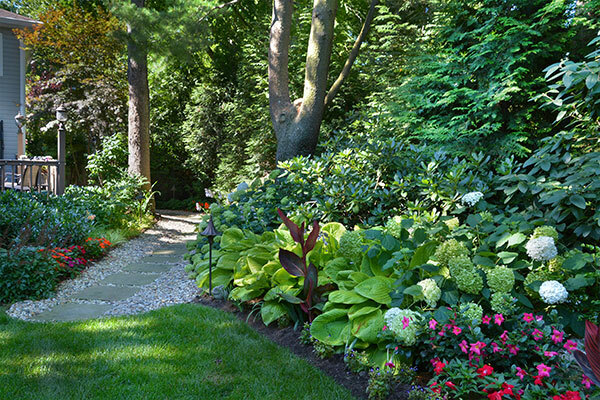 The side yard is now a lush garden path, with surrounding planting and gravel walkways. To invoke a peaceful and transcendental space, the team implemented a harmonic balance by using natural rock formations and the sound of flowing water. 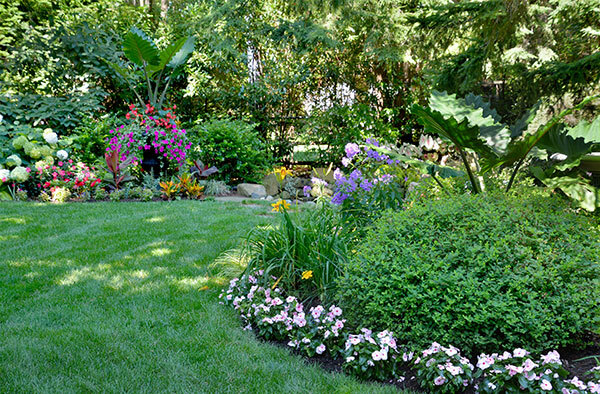 The meditation garden can be seen throughout the backyard. 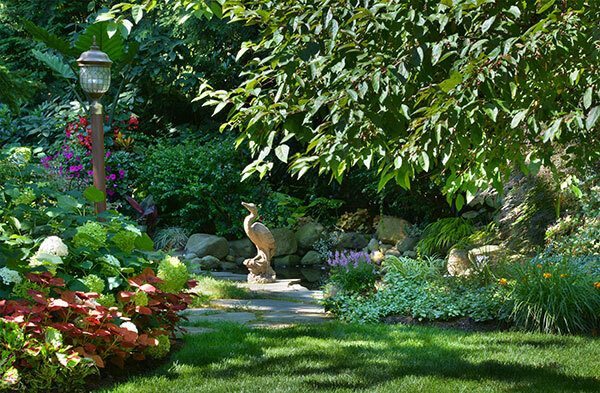 The serenity of the space is encapsulated by the presence of flowing water, colorful planting displays and garden ornamentation.